Brand: Chip Mccormick Custom, Llc. Built to the very highest standards for the no-fail performance competitive and self-defense shooters demand. Feed lips are roll-formed and polished, not die cut, for added strength, and Chip's proprietary follower design provides flawless feeding with semi-wadcutters and hollow points. Powerful spring of proprietary, heat-treated Rocket Wire further ensures reliable feeding, even when left fully loaded and seated in a pistol for extended periods. 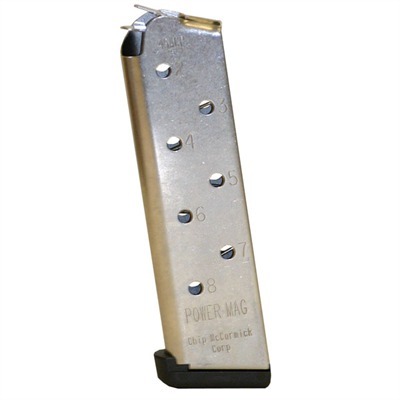 Removable plastic base pad with full, front-to-back engagement, is built to withstand continual use, and numbered witness holes on both sides of the body provide a fast, visible round count. Available in 8-round capacity with slightly Mfg: Chip Mccormick Custom, Llc. SPECS: Stainless steel body and follower. .45 ACP, fits 1911 Auto only. Mag. 8 - 8-round capacity.